A few days ago some of our advanced students, ages ranging from 8-15, performed for San Francisco Conservatory faculty member, brilliant guitarist and phenomenal teacher, Marc Teicholz, in our annual guest masterclass series. These events are always thrilling for everyone involved: students grow and learn from watching each other experience a class, students have the chance to receive guidance and praise from someone other their teacher, and the whole experience inspires them to keep working hard to refine and develop their ability to express themselves through their guitars. Repertoire heard in the masterclass was varied: Carlo Domeniconi’s Homage to St. Exupéry, Heitor Villa-Lobos’ Prelude #2, Gaspar Sanz’s Canarios, Johann Sebastian Bach’s Prelude (BWV999) and Gavottes (BWV995), Fernando Sor’s Etude #2 (Segovia’s Edition), two Brouwer Etudes, and Simone Ianarelli’s Detrás del arcoiris (Behind the Rainbow). 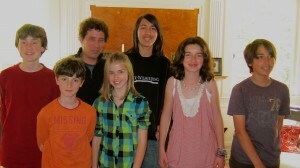 Marc’s insight and advice was inspiring to all and focused on both musical issues and technical advice. 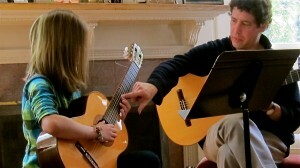 Award-winning guitarist Leo Garcia is the founder of KinderGuitar. He has worked with hundreds of children and families for over 15 years, and also is an active performer who has performed across North America, South America, and Europe. His writings have appeared in the leading guitar journals. Leo grew up in Venezuela but left to pursue higher education in the U.S., eventually earning four degrees (in economics and in music) from Yale University and the New England Conservatory, before developing the KinderGuitar music education system. KinderGuitar now offers training and licensing to highly qualified educators to help them create successful and sustainable music-teaching studios in their communities.